I try to time my reviews to coincide with upcoming crossovers or movies, but Marvel completely upended this review not hours after I started writing it. The gist of my theories were correct: the upcoming Secret Wars is going to be a major reality shift. What I didn't expect were the destruction of the Ultimate Universe and the merging of the remaining Marvel universes into one giant Battleworld. There are a lot of plot threads to untangle before “Time Runs Out," but I want to start with the core of it all: Jonathan Hickman's Avengers title. I've had a sense for a while that Hickman has been on a very different page from the rest of Marvel, all the way down to a theory that his books have been taking place on a different Earth than Rick Remender's books, just happening to share the major plot developments. I've decided to review two trades at once again because Hickman has publicly admitted that all of his books are one huge story instead of just arcs. This has had a major disadvantage since there are certain lengthy lulls between the major plot points; Avengers Vol. 5: Adapt or Die feels like it drags on a bit too long while not doing enough. Conversely, this gives the title excellent re-reading value. One minor panel in Adapt or Die turns out to have major consequences for Thor in his new identity as the unworthy Odinson. The seemingly pointless issue #24.NOW sets up the action for Avengers Vol. 6: Infinite Avengers a full six issues later. I'm still not going to ignore how stupid the “.NOW” thing is, but that's just marketing; it's better that than another relaunch. Said issue introduces the Iron Man of 3030 who puts into motion a plan to merge a rogue planet with Earth and fulfill a time loop. Much of Adapt or Die follows the Avengers as they return home from the chaos of Infinity and start moving towards a major internal conflict. While Captain America and Iron Man having a falling out might sound like a retread of Civil War, this time it comes about more organically, centering around the Illuminati's return. That doesn't mean their enemies aren't busy; AIM returns with two plots involving their investigations of alternate universes. The weaker one involves them sending Super-Adaptoids into the multiversal abyss. 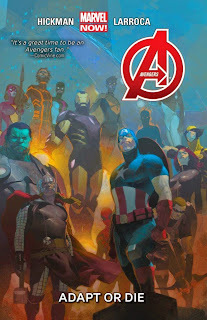 Hickman concentrates on the more interesting story as AIM finds an alternate universe's classic '60s Avengers line-up. The solicits play this up to be the actual early team as a riff on All-New X-Men, but they turn out to simply be evil versions instead. All the same, I like that there wasn't a one-to-one match between the teams, as it made the identity of Iron Man a neat surprise. At the very end of Adapt or Die, Bruce Banner figures out the Illuminati are back, and he ends up joining them and sending his evil lobotomized duplicate to SHIELD in his place. This is a smooth transition into Infinite Avengers as the events of Original Sin cause Captain America to remember his mindwipe at the hands of his apparent allies in New Avengers. A full battle between the Avengers and Illuminati is forestalled by the return of the Time Gem, thought lost when the Infinity Gauntlet blew up after Cap used it to stop an incursion. Unfortunately, it's broken, and it sends Cap, Iron Man, Hawkeye, Black Widow, Hyperion, and Starbrand into the future by increasing increments. Since time travel has been broken in other titles tying in to Secret Wars, this gives a look into the event's possible mechanics. Each of the futures visited are new ones with some interesting twists. They first jump fifty years to find a team led by a disgruntled and old Hawkeye who wants revenge on Iron Man. The next jump reveals just how dangerous their time travel is: in every jump, at least one person ends up falling back into the present and seemingly disintegrating along the way. Five hundred years in the future, the new evil android version of Captain America plants a bomb on his predecessor to destroy the Avengers from thousands of years past his time (this all makes sense in the comic). The jump to 5,000 years pays off the bomb plot and reveals Franklin Richards as one of the last humans, accompanied by a brilliant cameo that I don't want to spoil. At 50,000 years, the bomb plot goes off in a world occupied by hologram versions of the Avengers. By the final issue collected here, Cap is the Last Avenger, escorted to a point beyond time by a mysterious figure. This turns out to be Iron Lad from Young Avengers, who is joined by his two older counterparts: Kang the Conqueror and Immortus. It just wouldn't be an Avengers time travel story without at least one Kang, and to get the three major ones is a bonus. They throw Cap's plans and ideals into disarray in an attempt to stop Iron Man from causing more damage. His return to the present is the last thing we see before the book jumps ahead eight months. The rest of the Marvel universe is synching up to Jonathan Hickman's Avengers books as we speak, and I'm excited to see what happens after Avengers Vol. 5: Adapt or Die and Avengers Vol. 6: Infinite Avengers. With Esad Ribic, Salvador Larocca, and Leinil Francis Yu at his disposal in just these two trades, these books all look fantastic as well. I won't lie: the trades are expensive. But at the same time, they should be the only books you need to read to get ready for Secret Wars ... at least until Marvel contradicts me five hours after this review goes up. Even though the 8-month timeskip freed Hickman from dealing directly with Remender's recent stories, the book was still affected by them. It's one thing for Sam Wilson to become Captain America, but Avengers readers who haven't kept up with that book might wonder why Steve Rogers became an old man all of a sudden. What really concerns me, though, is Iron Man keeping his "inverted" persona at the end of Axis. Unless he gets "re-inverted" some time during Taylor's Superior Iron Man run, this might have terribly undermined the philosophical rift between him and Captain America that Hickman has been developing since the Illuminati mind-wiped him. Speaking of that, I like how tangentially vol. 6 tied in to Original Sin. Even if you haven't read the main mini, the scene where Cap remembers being mind-wiped still works as a self-contained event. Tony is still wearing his Superior costume in "Time Runs Out" and seems to still have that persona. He's not playing a huge rOle but there's a big event in between that hasn't been published yet.